Middletown Arts Center: REDUCE, REUSE, RECYCLE! 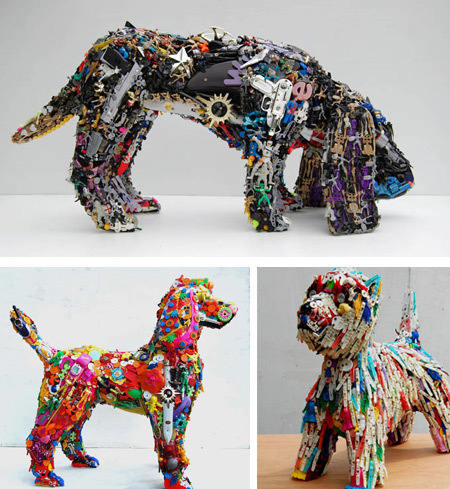 Robert Bradford creates these life-size and larger-than-life sculptures of humans and animals from discarded plastic items, mainly toys but also other colourful plastic bits and pieces, such as combs and buttons, brushes and parts of clothes pegs. In 2002, he started to consider his children's forgotten toys as parts of something bigger. Some of the sculptures contain pieces from up to 3,000 toys and are sold for US $19,000.